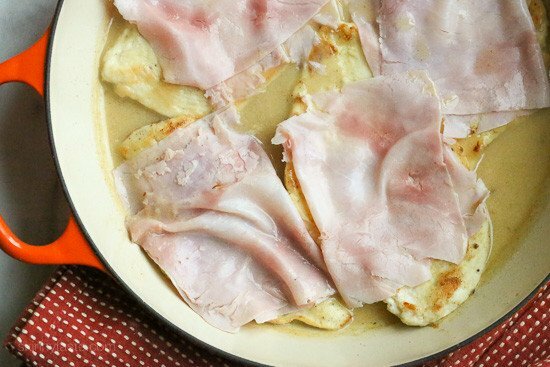 This EASY Skillet Chicken Cordon Bleu is made with thin sliced boneless chicken cutlets, lightly pan fried then topped with ham and swiss in a light Lemon-Dijon Sauce. No rolling! 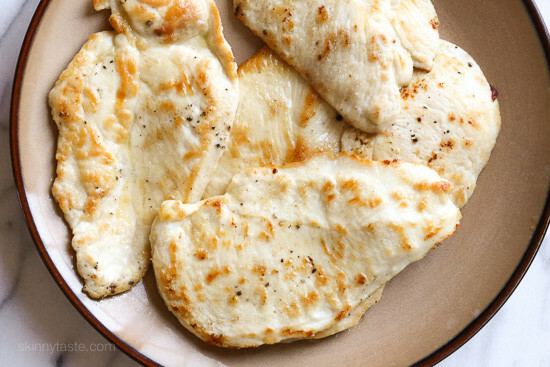 An easy weeknight chicken dish your family will LOVE! I love making Chicken Cordon Bleu which I usually bread, roll and bake. But I wanted something quick with the same ingredients and came up with this – lazy chicken cordon bleu made all in one skillet. This is great with roasted veggies or you can serve this with rice pilaf. I love making Chicken Cordon Bleu which I usually bread, roll and bake. 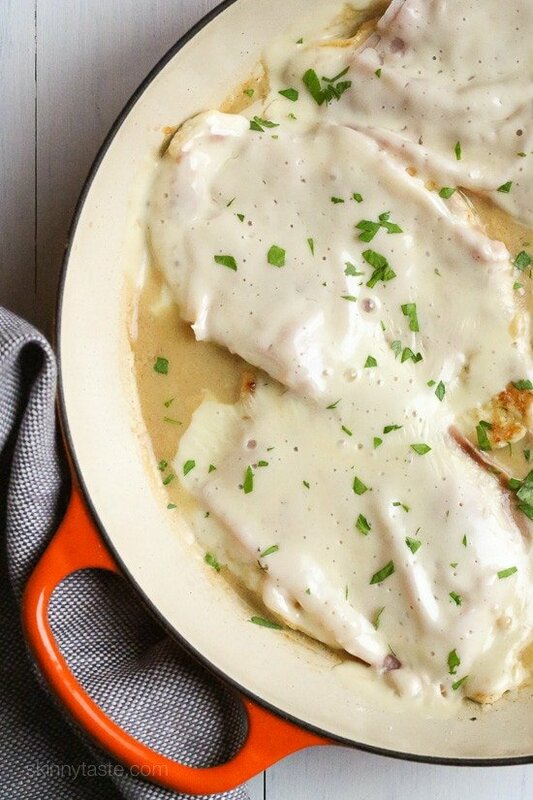 But I wanted something quick with the same ingredients and came up with this – lazy chicken cordon bleu made all in one skillet. This is great with roasted veggies or you can serve this with rice pilaf. * All purpose gluten-free flour works well here. Place the flour in a shallow dish. Lightly dredge the chicken with flour on both sides, shaking off the excess reserving the flour. Heat a large nonstick skillet over medium-high heat. Melt the butter and add 1 teaspoon of the olive oil and half of the chicken. Cook 2 minutes on each side, until slightly golden, then transfer to a dish. Add remaining 1/2 teaspoon olive oil and remaining chicken and cook 2 minutes on each side. Set aside on a dish with the other pieces of chicken. 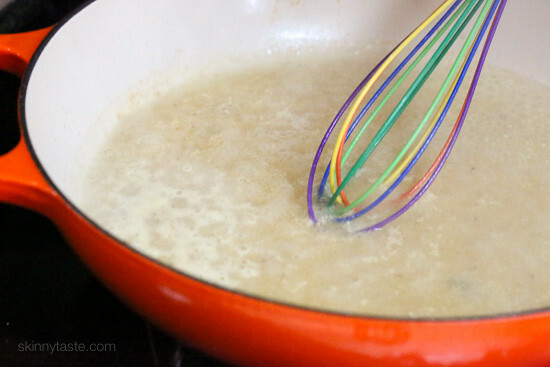 Reduce the heat to medium-low, add the chicken broth mixture. Whisk scraping up any bits stuck to the pan then simmer 2 minutes to reduce slightly. 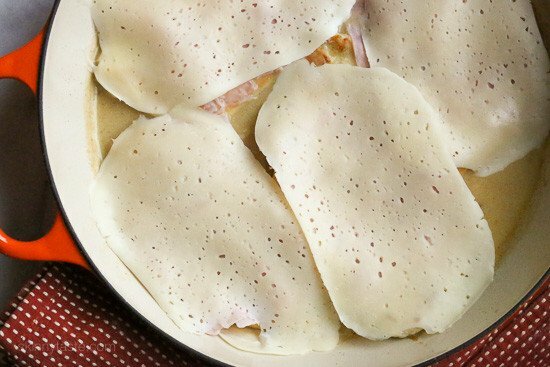 Return the chicken to the skillet, top each piece with a slice of ham and a slice of swiss, cover the skillet and simmer medium-low for 3 to 4 minutes until the cheese melts. OMG, so delicious! Easy to make, too. 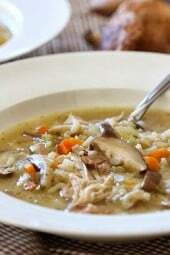 Family loved it, definite make again recipe. My kids all for this every week! I used mozzarella instead of swiss. Instead of cutlets, I place chicken breasts between plastic wrap and pound them flatter with a kitchen mallet. Old school classic….reinvented and YUMMY!! My 17 year old son and hubby licked their plates! We just finished eating this and it was a huge hit! Hubby had wanted me to make traditional Cordon Bleu but I was having a bad pain day and when I found this I knew I could handle it. Kids are kind of picky so I used a shredded cheese blend for theirs and the Swiss for us. 8 thumbs up. Such a good recipe! I make this on the week notes often! This is absolutely delicious. And so easy. I didn’t have have so used deli turkey and it was still wonderful. This is a repeat for us. I love healthy tasty recipes! Yum! Love this! I used to make it, roll it up the chicken etc etc. This is so wonderful, the taste without the hard work. Thank you! Just made this for the first time. Was scared to let my husband know what I was cooking, he does not care for ham or swiss. It was a HUGE success! He took one bite and said “oh my this melts in your mouth” So it will be going into rotation. I’m making this tonight. I Plan on making it with baby spinach. Do you think I can cook it in the sauce or separately? Did you use the spinach in the sauce? My husband might like that too. 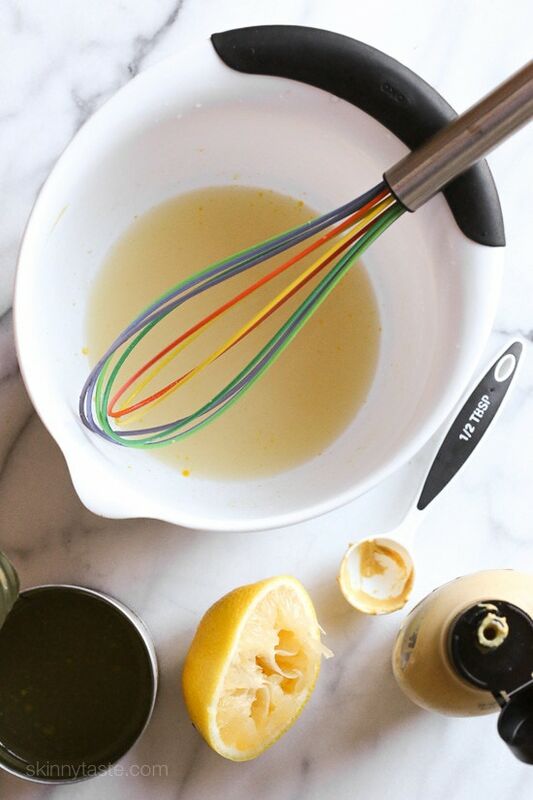 This is quick, easy and absolutely delicious! I served it with orzo with lemon, parmesan and peas and roasted asparagus! Thank you Gina for another great recipe. This is definitely a keeper and will be making often. This recipe is absolutely delicious. We loved it! I served it with Lemon Orzo with parmesan and peas and roasted asparagus. My husband asked me to be sure to add it to the list of keepers. Last night we had the Fish Florentine and loved that too! 2 definite winners for me!! Thank you, Gina! I love that you include WW points and gluten free options. This look delish! OK…Seriously!! 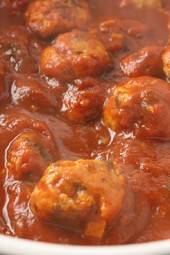 One of my favorite recipes!!!! This is amazing..YOU must try this!! I entered this in my WW app and the points were less??? I didn’t use cutlets, I just sliced a thicker chicken breast in thirds. Is Is it supposed to be completely cooked through in the 4 mins on the skillet? I don’t think mine cooked all the way through. One of my favorites. Very easy. Shared it with my landlady and after eating it she told me to look away as she slurped up the residual sauce on her plate. To save time, I recommend buying the cutlets already sliced thin. I think it was Purdue brand that had then pre-sliced. I’ve made this twice now. My littlest, pickiest eaters have loved it as much as I have. Super easy and delicious., instead on salt I used Tony’s. This was amazing!! 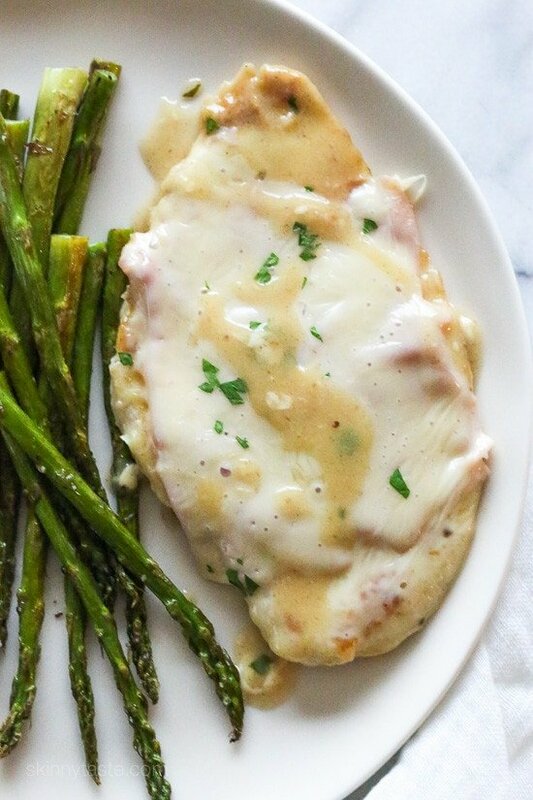 I never thought I liked Chicken Cordon Bleu until now lol regular rotation for sure!Next time I won’t season the chicken with salt first though because I found the ham made it pretty salty :)I served with your roasted Asparagus as well! Well, THAT was AMAZING. :)Pairs very well with asparagus. This is so easy and delicious! True comfort food! Gina I love that your recipes don’t make me feel like I’m missing out by eating healthy! You never disappoint me! Thanks for sharing your recipes! You are truly talented! Had my eye on this one for a while now and finally got around to making it. Wish I had made it sooner!! So good! The sauce really tops it off! I made this tonight. We are watching our carb and salt intake. This was easy, fast, and pretty on the plate. I pounded all the chicken breasts so they were of a uniform thickness; and instead of salt I used Mrs. Dash. I really didn’t think the sauce would be good because there weren’t many ingredients..but I was so wrong. I am also going to try this with thin cut well trimmed port loin.Thanks so much…this healthy entrée is good enough for company. I’ve now made this two nights in a row after the rave reviews at the dinner table last night. So delicious that it felt like a guilty pleasure. The only substitute I made was lean (already cooked) turkey bacon for the ham – it was what I had on hand. And it turned out to be amazing. Served it with your Creamy Cauliflower Puree & roasted asparagus since it looked so good in your photos. This is a new favorite in my house & will be added to the rotation. Thanks, Gina! Love this recipe! First time making it and definitely man-approved. Quick and easy.. oh so good! Hubby doesn’t like most of the food that I’ve been cooking since being on WW, however he said this was really good. Winner! This was beyond delicious! Might be my favorite recipe of yours so far! My kids enjoyed it too, which is a major bonus! I think next time I’ll double the sauce and add it to some cauliflower rice! Yummmmm! Kim- Have you ever tried soy flour? I wouldnt use it very often just because i hear soy can mess with hormones, but i think its keto approved. Soooo yummy! Husband and 9 year old daughter approved! Thank you Gina!!! If you wanted to try and make this somewhat keto approved, what would you recommend to use for the flour without changing the taste? Almond flour…..I’m not certain. This is a family favorite in my house and I am trying to go easy keto. Dee-licious – Gina, you’ve done it again! Thanks!!! This is one of our favorite recipes, skinny or not! I could eat it every week, it’s that good, and easy. Thank you for all your great recipes and the help you provide in meal planning. would this work with coconut flour also? Delicious! I’ll definitely make this again. Followed to a T and it came out perfect. This was delicious! Very easy to make. Even my 3 year old loved it! Hugh hit! Easy and fast to make. OMG! This dish was amazing! Made this last night and my husband loved it. Will def make this again!!! This is scrumptious! 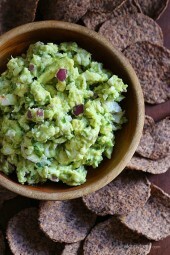 Easy to make, quite flavorful and such few points!! Win-win!! This is the best recipe I have ever made (healthy or not.) The fact that it is lower calorie is just the bonus! Love this recipe! Quick & easy and my son even eats it! I made this last week and my husband loved it!! (he’s kind of a picky eater!) So easy and so delicious! The kids and I loved it! I’ve made this twice, and we loved it so much and it was so easy,…I am going to try and make it for my daughters homecoming dinner (for 90 kids) Anyone have any suggestions? I love this dish! Simple, tasty and guilt free! is this still 5 points on the new freestyle plan? Thanks in advance! 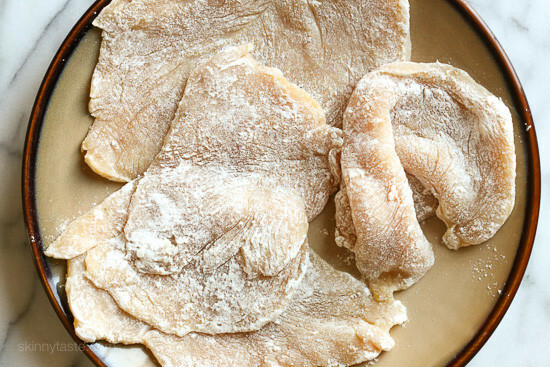 Are you able to buy thin boneless, skinless cutlets, or do you have a technique to cut and pound them? I buy them but you can also cut and pound if you can’t find them in your area. Made this last week, easy and delicious! This will be cooked again! Delicious.. good enough to serve company and easy enough for a weeknight dinner. Too funny about the lemons, so glad you enjoyed it! I made this and substituted almond flour. Came out perfect!! This recipe is absolutely amazing! I’ve made it several times with Boars Head Maple Glazed Honey Ham and Swiss cheese and it’s just perfect!! A great weeknight dinner. I make this with oven roasted broccoli and mashed potatoes. Yum! Thanks for all of your fantastic recipes, Gina! Anything different with the sause? What can we replace the Dijon with ? Any mustard you have on hand. I don’t normally respond to blog postings, but last night I tried this recipe, and it was AWESOME!!! The sauce was so yummy! Chicken nice and tender. My husband tiredly licked the sauce from his plate! I have pinned it, because I’ll never find it again. Thanks so much! LOVED the chicken cordon bleu!! Made these last night and turned out awesome. I’ve been looking for an easy chicken cordon blue recipe for a while and this finally fit the bill. I didn’t have Dijon in the house so I used honey mustard. It was amazing! Lol! Glad you both enjoyed it! This is definitely a winner! Not only is it tasty, but it’s easy to prepare and quick. I got out of my exercise class, stopped by a department store, came home and still got dinner on the table in under 30 minutes and got the kids to bed on time. What’s more is everyone around the table approved of this recipe and said it was definitely a keeper. Thank you! So simple and so delish. I was surprised how really good it was. I’ve recommended the recipe to family and friends. I used provolone and black forest ham since it’s what I had on hand. I’ll be making this again for sure. Note: I did have to,use more oil than the recipe called for. I want to make this but Japan doesn’t have chicken broth 🙁 What to do instead? What about vegetable broth? Or if you can find bullion cubes that would probably work fine. Otherwise, you can always make it yourself and freeze what you don’t use in ice cube trays or other containers for later. This looks delicious but I hate ham!! Can I use prosciutto? Looking forward to making this in the next few days. Was considering pairing it with the asparagus with Dijon mustard sauce you also have on your site… What else would you suggest to go with it? Side dish? Salad? I’ve been looking for new recipes to add to the family dinner rotation. This one is greater! I’ve made it twice now, and we all love it. HAD THIS AND LOVED IT, HAVING AGAIN TONIGHT FOR DINNER. AWESOME RECIPE. I want to make this for 8 people but don’t have the pans. Can I do it all and then put it in oven to simmer? How long and what temp would you suggest? Awesome dish! The whole family loved it. Do you think any of the timing would change if I used boneless, skinless thighs? They are a little thicker so maybe add a few minutes. This is one of my Skinny Taste favorites (so far – can’t wait to try more of the Latin-inspired dishes). It’s also really good leftover. I re-heated it in a foil packet for a few minutes in the oven and made an open-faced sandwich with tomato and spinach. Definitely a winner! Love Love Loved it1 I’m not a fan of the breast, so I bought skinless-boneless thighs. I pounded them out. My kids turned up their picky noses, but once they tried them, they were all eaten up. When does the salt get used? I dont see it in the directions. Loved this one – thanks! I’m not a great lover of mustard so halved it and I used mozzarella so that I could avoid a trip to the shop. Delicious, I’m loving your recipes Gina. I just made this. Wow, is it ever good! Thanks for another great recipe. Just made this for dinner, oh my goodness, delicious!! Very simple to make and turned out awesome! My hubby is always nervous about chicken, but he agrees it’s a keeper. Love how easy this one is and how the whole family loves it! Even the pickiest of eaters in our family gobble this one up. This is in our regular rotation now, thanks! Made this for dinner tonight. Started low carb today and this was totally satisfying. Just cut the dredge in flour part, but I didn’t feel like it was missing anything. Delicious! Think this could be subbed with pounded thin porkchops? I used turkey cutlets since the story didnt’ have chicken. I was able to start at 6:30 and had food on the table by 7:10!! My 3 year old and 5 year ate it up!!! def going to be a go to for us!! Cooking right now!! Looks delish! Can’t wait to dig in!